Over the course of my life, I have been blessed to be Godfather to a variety of my family and friend’s children on the day they receive the Sacrament of Baptism. After a very difficult beginning to 2015, this past month will be a month I won’t soon forget. Two weeks ago I was Godfather to my friend’s little girl, and this afternoon, on what would have been Dad’s 68th Birthday, I will be Godfather to my nephew, whose middle name is the same as Dad’s. As one who prepares adults to receive the Sacrament of Baptism on the Easter Vigil each year, which is a moving experience itself, witnessing and being asked to be a Godfather is one of the best honors a Catholic can receive from either family or friends. Not that numbers matter, but with this month’s two baptism’s, I am now Godfather to five children. Even as I write these words, I shake my head thinking how unworthy I am to fulfill such an important role. It’s only through the grace of my own Baptism, Confirmation, Holy Communion, and the frequent reception of Reconciliation that I am able to fulfill such a duty. 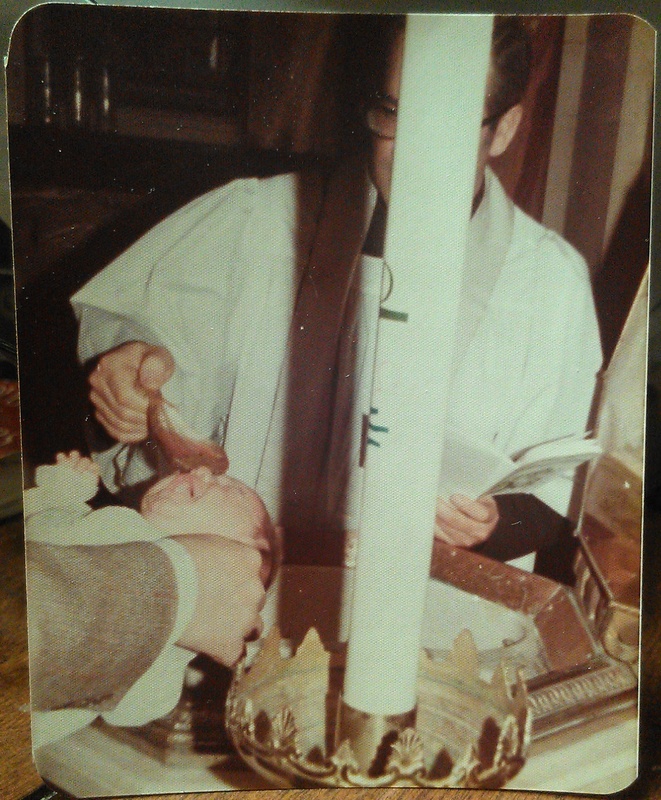 My Baptism by Rev. Joseph Nativo at St. Lucy’s Catholic Church in Newark, NJ on March 17, 1974. Since I spoke about infant baptism above, I draw your attention to paragraph 1282 below and paragraphs 1250-1252 in the further reading section. Infant Baptism has been part of the tradition of the Church since the very beginning, but it’s on this subject that many non-Catholics disagree with the Church’s position to baptize infants claiming that a child has no sin and has no reason to be baptized. I can’t tell you how many people I have spoke to in my position at the parish in RCIA that wished they were baptized as children. For further reading on the Sacrament of Baptism, I would highly encourage you to read paragraphs 1214-1274 in the Catechism. Please also pray for my nephew today on the day of his Baptism, pray for his parents, and pray for me.